Hardware diagnostic results of 359 patients with complicated hepatic echinococcosis were analyzed. NLS, radiography, CT (computer tomography) and MRT methods were used in examination. Staging radiology examination was preferential. NLS method was used in all patients during pre- and postoperative periods. CT and MRT methods were used in 49 and 76 patients respectively. The results of commonly used hardware examination methods have shown that mixed analysis of these methods greatly increases specificity and sensitivity in preoperative diagnostics of complicated hepatic echinococcosis. New development stage of echinococcosis surgery is associated with development of new and more informative diagnostic tools: NLS-research in the first place, computerized tomography (CT), magnetic resonance tomography (MRT) and helical computed tomography (HCT). According to various authors, information value of NLS method in case of hepatic echinococcosis depends on parasite development stage (live or dead), and is at least 90-97% on average. Diagnostic difficulties may occur in large cyst patients (with live parasites), as well as in patients with dead echinococcosis. CT and nuclear magnetic resonance diagnostic errors frequency in case of liver formations less than 1 cm. is up to 52%. Radiographic diagnostic method is subsidiary and it may generally show indirect signs of complicated hepatic echinococcosis. Detection frequency of radiographic signs such as high position of diaphragm cupula, its deformation and limited mobility, is only registered in case of subdiaphragmatic cyst location, its large sizes, and it ranges from 12.5 to 23.4%. Use of NLS (which in comparison to CT provides panoramic images and higher sensitivity superior in certain locations, accurate differential and regional diagnostics) was the next step in diagnostics improvement of complicated hepatic echinococcosis. NLS provides more efficient differentiation of «pseudo-soild» echinococcosis forms from tumors by means of spectral-entropy analysis (SEA). Overall accuracy of NLS-diagnostics in case of echinococcosis is more than 95%. NLS diagnostics method has the following key advantages: effective estimation of cysts size, their number and location in liver, their interrelation with vessels and bile ducts, parasites development stage estimation and also detection of other organs affection by echinococcus. This information is crucial in surgical approach determination, planning of operation type and its scope, and also suggesting of possible intraoperative complications. As can be seen from the above, the introduction of NLS with SEA into clinical practice significantly improves diagnostics of complicated echinococcosis (especially in its early forms) which allows often performance of radical and, at the same time, economical intervention. However, existing methods of instrumental diagnostics do not provide 100% accurate results. In 2-9% of cases it is not possible to establish the nature of hepatic cyst formation using hardware research methods. The purpose of given research is to determinate the peculiarities of hepatic echinococcosis hardware diagnostics and its complications. Given research is based on clinical observations analysis of 359 patients suffering from complicated hepatic echinococcosis at Surgical pathologies department of Tadzhik State Medical University n.a. Abu Ali Ibn Sin as part of surgical departments of City clinical hospital of Dushanbe city in the period from 2008 to 2012. Patients age ranged from 16 to 76 years. Urban residents – 46.2%, rural – 53.8%. Complications in the form of hepatic echinococcosis suppuration and calcifications were registered in 279 (77.7%) patients. Hydatid cyst festering with clinical picture of purulent intoxication found in 123 (34.3%) patients and burst to abdominal cavity found in 3 (0.8%) patients were considered as the most severe complications. Bursts to biliary tracts and cholangitis clinical picture registered in 53 (14.7%) patients. Primary echinococcosis was registered in 293 (81.6%), relapsing echinococcosis in 37 (10.3%) and residual echinococcosis in 29 (8.1%) of the total number of observed patients. Solitary echinococcus cysts were found in 97 (27%) patients, multiple hepatic echinococcosis found in 262 (73%) patients. 87 (33.2%) patients had 2 cysts, 175 (66.8%) had 3 and more hepatic cysts among the patients with multiple lesions. The following methods were used as instrumental ones: NLS, X-ray imaging, CT and MRT. In our research we used «Metatron»-4025 (IPP, Russia) NLS-scanners with non-linear sensors, frequency 4.9 GHz. «Metapathia GR Clinical» professional software (with micro-scans research, SEA and 3D-images visualization) was used together with «Metatron»-4025 system. Breast plan radiography was performed using «Stephanix» (France) digital-image system to exclude combined echinococcus lung affection. Position of diaphragm cupulae, calcification areas in liver view were studied simultaneously to detect indirect signs of hepatic space-occupying mass. Information value of the research in many ways depended on echinococcus cyst location and condition. 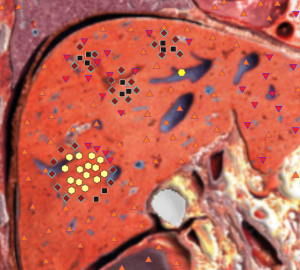 Computer tomography of liver was completed in 49 (19.8%) index group patients using Somatom plus 4 (Siemens, Germany) CT scanner. Dynamic CT with bolus dosing of contrast agent was performed in case of focal lesions. Helical computed tomography characteristics: X-ray tube voltage 120 kV, current 200-350 mA, image matrix 512 × 512. Slice thickness – 7 or 5 mm., table feed speed corresponded to emit layer thickness – 7 or 5 mm. (pitch = 1), remodelling index – 5 or 4 mm. Metric and densitometric analyses of images were performed. Organs and tissues density was determined in Hounsfield (ed.N) units. Multiplanar and three-dimensional models were used in addition to diametrical scans analysis. Liver total volume, volume of lesions and intact parenchyma volume indices were calculated by Roi Volume software using series of successive scan images. Decisive matrix principle was used for evaluation of NLS data objectification. Information value characteristics such as false-negative, true positive, true negative, false-positive fractions were studied. Information values of research such as sensitivity, specificity, diagnostic accuracy and predictability of positive and negative tests were evaluated. Using NLS with spectral-entropy analysis allowed distinguishing echinococcus cysts from non-parasitic ones and also from polycystic liver disease even with lack of other differential-diagnostic signs. Shallow thickness cyst capsule was registered in 63.2% of echinococcosis cases. Partial or total capsule calcinosis (which is a specific sign of disease parasitic character) was detected in 1/3 cases. Secondary cysts and multiple abdominal organs affection (spleen and mesostenium) was registered in 6% of echinococcosis cases. 76 patients underwent magnetic resonance tomography using Concegto (Siemens, Germany) system. High-resolution differentiation of changes in liver architectonics served as a specific advantage of this method. Circle of weak change of MR-signal (hypointense as shown in T1- weighted image, hyperintense in T2-weighted image) with indistinct contours that corresponded to pericystic changed was visualized on MR-tomograms around hydatid cysts. Volume of echinococcus cysts, volume of non-affected liver parenchyma and manifestation degree of organ’s compensatory hypertrophy data using MR-volume measurement procedure was calculated. MRT allowed diagnosing echinococcus cysts in abdominal cavity in combined echinococcosis case with no additional contrast enhancement of intestinal tract. Capsule and pericystic changes visualization showed the following differential-diagnostic signs of liver echinococcus cysts. T2-weighted image presented cyst as high intensity MR-signal irregular round-shape area with distinct smooth contours. Hydatid fluid had even hyperintense signal with its moderate hypointensity in basal parts having large number of “hydatid sand” in cyst. Interseptums in cyst lumen, walls of secondary and tertiary cysts had hypointense signal. Chitin shell of cyst delivered hypointense signal. Objective estimation of information value of different diagnostic methods was performed by aggregating of sensitivity, specificity, accuracy of positive and negative results indices and also total number of correct results. All patients in preoperative period underwent NLS of liver that allowed considering lump sizes and its interrelation with intrahepatic tubular structures, including pathological formations and their localization in liver segments. Delaminated on the whole length or fragmentarily chitin cyst envelope in form of hyperchromogenic strips (5-6 points according to Fleindler’s scale) in case of dead parasite was distinctly registered in cyst lumen of 147 patients. Specific feature of cyst’s parasitic nature is revealing of secondary and tertiary bubbles in cyst cavity and high similarity to echinococcus granulosis standard at SEA (D <0,425). Liquid contents of space-occupying formation having hypochromogenic structure (1-2 points according to Fleindler’s scale) which allowed differentiating cyst from benign tumor and which was confirmed by spectral-entropy analysis, served as marking in case of larger cysts. In case of large-scale cysts, contours of cysts may change, thus outlines ovality remains almost the same with no marked deformations. Usually by this time, liquid quantity becomes sufficient for structure differentiation of liquid contents of space-occupying mass. Contours of secondary cysts found in cyst itself with confirmation by spectral-entropy analysis also may serve as such marking. Considering that hepatic echinococcosis may cause multiple and combined nature of lesion, all patients (n = 359) obligatory underwent NLS with spectral-entropy analysis of spleen, kidneys, and in case of recurrent echinococcosis (n = 37) patients also underwent spectral-entropy analysis of small pelvis organs. Studies have shown that NLS provides both diagnosing of hepatic echinococcosis and establishing parasite development stage. NLS-graphic picture of echinococcosis cysts was characterized by significant polymorphism depending on life stage of cysts, calcification degree of fibrous capsule and presence of secondary cysts. Acentric, atypical NLS-graphic hepatic formations similar to tumoral ones were the hardest for differentiation. Microscanning with spectral-entropy analysis assisted in differential diagnostics. The necessity of differential diagnostics of echinococcus cyst with other hepatic formations (n = 76) appeared in some cases. We also used microscanning with spectral-entropy analysis in these cases. Serological examinations results were also considered. NLS with spectral-entropy analysis sensitivity was 94.7%. Computer tomographies analysis allow specifying localization of parasitic cysts in liver according to segmental structure, relation of parasitical focal spot to parenchyma, capsule, portal vein, large vessels, inferior vena cava and nearby organs. Shape, outer and inner cyst contours, wall thickness and density, content, signs of calcium salt deposits were estimated in 49 patients during analysis of CT scans. Computer tomograms of examined patients revealed the following signs of complicated echinococcus cysts: thickening of cyst wall, its contours unevenness, dissection of parasitic membranes, contents inhomogeneity, secondary cysts, perifocal hypodense rim. Density of cysts contents varied from 9 to 42 HU and it increased in later stages of echinococcus disease. Secondary cysts had lower density than parent cyst. CT image showed that complicated (dead) echinococcus (found in 11 patients) was accompanied by increased density of parasite cysts contents up to 36-42 HU. Parasitic membrane fragments in the form of high-density convoluted linear structures were visualized in hydatidoma lumen. Conchoidal capsule calcification was registered on cysts periphery. CT detected multi-chamber cyst formation with massive capsule calcification in 12 patients (NLS revealed hyperchromogenic arc symptom with achromogenic area in these patients). CT was leading method in echinococcosis differentiation with liver metastatic lesions accompanied by colloid colon cancer (n = 6). Metastases distinguished by internal solid structure with multiple lumpish inclusions of calcium inside. CT was additionally used for differential diagnostics between parasitic and non-parasitic liver cysts in questionable cases in 5 patients. Differential diagnostics was based on the following CT-criteria: densitometric parameters of echinococcus and non-parasitic cysts differed in case of large cyst sizes, making 10-25 HU in case of echinococcus cyst and 0-15 HU in case of non-parasitic cyst. It allowed distinguishing echinococcus cysts from non-parasitic cysts and cystic liver disease even in the absence of other differential-diagnostic signs. The density of echinococcus cyst contents significantly increases (20 HU and more) after parasite’s death. CT and NLS sensitivity and specificity analysis in the diagnostics of complicated forms of echinococcosis was performed. It was also revealed that combined use of these methods allows establishing accurate preoperative diagnosis in 93-95% cases. Multiple disease relapses, decided laparotomy refusal by patients, elderly patients, and high degree of operational and anesthetic risk factors may serve as indications for percutaenous interferences in case of festering liver echinococcosis. Infection and contamination risks of abdominal cavity, impossibility to visualize biliary fistulas and terms extension in using of drain tube – these factors justify cautious attitude towards minimally invasive percutaneous treatment for patients in this category. Traditional laparotomy is recommended in majority of festering liver echinococcosis cases. Given study allowed defining indications for classical open surgery or minimally invasive percutaneous drainage. Possibilities for puncture treatment in patients with complicated liver echinococcus cysts and indications / contraindications for such interventional procedures were considered. Indications for percutaneous treatment methods of festering liver residual cavities, choice of control depending on location, size and content of pathological focus were substantiated. Analysis showed that CT appeared to be the most specific (88.2%) and sensitive (82.5%) method in diagnostics of complicated liver echinococcosis. It was also established that NLS and CT have different sensitivity and specificity in the diagnostics of complicated hepatic echinococcosis, which necessitates complex sequential application of both methods. Relatively poor indices of diagnostic efficiency of latex particle agglutination reaction do not allow using it as prehospital monotest, but the value of serological reactions increases in case of differential diagnostics of residual cavity recurrences after echinococcectomy. MRT was performed in general group of 76 patients in the final stage of non-invasive diagnostic examination to elaborate in details the nature of pathomorphological changes in lesion focus and clarify involvement degree of major vascular secretory structures into the process. Free choice of image planes allowed clarifying the topical diagnosis in 76 observations. On the other hand, additional significant signs of parasitic cysts in patients were detected due to the high soft tissue contrast during MRT procedure. For example, MRT was the most informative in detection of irregularities inside cyst edge and detection of parasitic membranes dissection starting process. Thus, in 69 patients the difference of fibrous capsule hypointensity and chitin shell of the parasite showed two-layer image of cyst wall in tomogram, which was common only in parasitic cysts and it allowed its differentiating from all other cystic lesions. We used the same program in 29 patients but in different planes (axial, coronary and sagittal) for topical diagnostics, especially in case of multiple lesions and large size of cysts when the definition of its organ affiliation was difficult. T1- and T2- weighted images displayed cyst wall as very low intensity rim surrounding the cyst with fat-signal suppression. Cyst wall thickness ranged between 1 and 5 mm (average thickness 2.3 ± 0,8 mm). Linear areas of reduced signal intensity in lumen were common for dead cysts and represented loose chitin shell. T1 weighted image showed cyst in the axial plane as incorrectly rounded, clear smooth-contoured area with reduced intensity of MR signal. Cyst wall was usually difficult to differentiate due to similar low-intensity signal, the same as fluid signal in cyst cavity. Suppression of fat tissue signal allows us differentiating fat and hemorrhagic inclusion in cysts, which was especially important in diagnostics of complicated hepatic cysts. Calcifications in cyst walls were detected in the absence of MR signal, i.e. as in dark wall areas with low or very low signal intensity. Use of MR-angiography and MR-cholangiopancreaticography allowed accurate localization of the extent and topographical interrelation of cyst with large vessel and also ductal system of liver in 19 patients. Correct interpretation of images using MRT was possible in all cases (n = 76), when cysts had diameter greater than 25 mm. These cysts always had the following typical signs corresponding to echinococcus lesion: fibrous and chitin cyst membranes with hypointense gap between them, calcification in fibrous capsule wall, secondary cysts in lumen of mother cyst, floating chitin membrane in cyst lumen (lily symptom). However typical characteristics of echinococcus cysts were not always revealed in case of cysts less than 25 mm in diameter (in our case in 4 patients) and therefore differential diagnostics with other cystic liver lesions was extremely difficult. Comparison of diagnostic accuracy of our methods allows suggesting that NLS with spectral-entropy analysis is the most accurate method in detection and differential diagnostics of complicated hepatic echinococcus cyst. Pic. 1. Complicated hepatic echinococcus cyst with thinned capsule and secondary bubbles. As can be seen from the above, NLS is non-invasive diagnostics method, allowing effective examination of patients who suffer from complicated hepatic echinococcosis and perform differential diagnostics of the disease. Spectral-entropy analysis provides an opportunity to identify morphological characteristics of the parasite, which have determining value in surgical treatment choice. It is possible to recommend this method as specifying one, a method that can be used in diagnostically difficult cases, as well as to define the localization of extrahepatic abdominal cysts and for preoperative examination of patients with complicated hepatic echinococcosis, especially in cases when affinity of cysts with liver vessels and biliary ducts needs to be specified. In case of mixed examination, the involvement of major vascular hepatic structures and inferior vena cava was registered in 20 general group patients; vessels displacement and compression was the most characteristic feature. Both helical computed tomography with bolus contrast enchancement and MRT methods were the most effective diagnostics methods of these complications. There is a clinical observation. Patient A., 36 years. Presented problems on weight feeling in right hypochondrium, asthenia. Objectively: clear heart tones, rhythmic, pulse 86 bpm. Arterial pressure 120/80 mm Hg. Soft stomach, painless. Laboratory data: clinical blood analysis – eosinophilia, clinical urine analysis, coagulogram within normal range. NLS of abdominal cavity organs showed cyst formation, occupying VI–VII segments of right hepatic lobe with multilayered capsule common for echinococcus. Cystic nature of changes, localization and presence of thick capsule were specified using MRT. Echinococcus cyst in VI–VII hepatic segments was registered based on mixed diagnostics. Calcification foci common for parasitic hepatic cysts were found in 3 patients. Cysts more than 100 mm in diameter were registered in 34 patients. NLS with spectral-entropy analysis method was the most informative and universal one, which is a screening method for patients examination with cystic lesions of the abdominal cavity. Precise diagnosis of hepatic echinococcosis was established in most of the cases when using NLS. Determination of nature of intracystic inclusions (secondary cysts, septums and etc.) assisted in differential diagnostics. Serological reactions (indirect hemagglutination reaction, immunoenzymometric analysis and antigen serological diagnosis) for echinococcosis, as well as cytological, bacteriological and biochemical studies data served as spectral-entropy analysis confirmation results. NLS had considerable information value in case of multiple and widespread echinococcosis. Definition of precise niveau diagnosis during NLS was easily achievable in giant echinococcus cysts and multiple lesion cases. Combination of NLS with CT or MRT was necessary in some cases. Complexity of differential CT-diagnostics in case of echinococcus liver diseases was associated with structural features of parasitic lesions. Differentiation between ordinary and monovesicular echinococcus thin-membrane cysts, without parasitic membranes and internal structures dissection caused some difficulties. In these cases correct diagnostics was based on mixed clinical-laboratory and radiation examinations of patients. When analyzing helical computed tomography results with bolus contrast enhancement, we have registered that contrast enhancement of surrounding liver parenchyma in parasitic cysts was diffuse-uneven in 50% of cases. Biliary cystadenomas were the most difficult for differential diagnostics among benign liver tumors in case of echinococcosis. Correct tumors diagnosing was promoted by detection of tumor nodules and papillary masses that accumulate contrast agent in case of enhancement. X-ray examination in terms of fistulography used in patients (n = 12) with complicated postoperative cystobiliary fistulas for monitoring of residual cavity or effectiveness or post-surgical treatment. Diagnostic efficiency of NLS, CT, MRT and serological methods was evaluated based on surgical treatment results (Table 1). Diagnostic efficiency of hardware research methods in detection of liver echinococcosis is shown in Table 2. Analysis had shown that the most specific and sensitive methods in determining liver echinococcosis were NLS with spectral-entropy analysis; MRT and CT took second place. Complex analysis of hardware methods data significantly increased their specificity and sensitivity in preoperative diagnostics of parasitic lesion. As can be seen from the above, mixed hardware examination allows high precision diagnosing of hepatic echinococcus affection and its complications by differential diagnostics of focal hepatic lesions. Considering sonographic semiotics and diagnostic algorithm sequence, NLS with spectral-entropy analysis, CT and MRI methods are recommended for diagnosing of complications origin. 1. Pedroza I., Saiz A., Arrazola J. et al. Hydatid disease: radiologic and pathologic features and complications. Radiographics 2000; 20: 795–817. 2. Cheremisinov O.V., Zhuravlev V.A., Shcherbakova N.A. Features of mixed diagnostics in combined liver and lungs echinococcosis. Med. vis. 2005; 4: pages 46–50. 3. Kharnas R.S., Lot A.S., Musaev G.H. NLS-semiotics and hepatic echinococcosis classification. Med. vis. 2012; 2: pages 46–51. 4. Kharchenko V.P., Kamalova K.Ts., Shrestkha H.K. Echinococcosis radiology of various localizations. Radiology -2006. Materials of research and practice conference. Moscow, 2006. 5. Puzeeva A.S. NLS with 3-D image reconstruction in surgery: Thesis synopsis of medical sciences candidate, 2013. 6. Czermak B.V., Unsinn K.M., Gotwald T. et al. Echinococcus granulosus revisited: radiologic patterns seen in pediatric and adult patients. Am. J. Roentgenol. 2001; 177(5): 1051–1056. 7. Belysheva E.S., Bychenko V.G., Sotov A.T. and others. Magnetic resonance tomography in multiple diagnostics of hydatid hepatic echinococcosis. Med. vis. 2003; 2: pages 6–12. 8. Agaev R.M., Budan A.K. Diagnostics and treatment principles of hepatic echinococcosis. Ann. sur. 2009; 3: pages 54–60. 9. Akmatov B.A. Modern diagnostics of hepatic echinococcosis. Healthcare Service of Kyrgyzstan, 1991; 6: pages 28–31. 10. Tokar’ S.P., Davydova A.S., Guseva T.L., Gusarov V.I., Khabibullina Z.F., Pugacheva L.S. «Non-linear computer diagnostics and hepatopancreaticoduodenal area pathology issues»// Collection of scientific works of Institute of Practical Psychophysics «Topical issues of NLS-diagnostics». Vol. I. Moscow: Catalogue, 2006, pages 77-88. 11. Shvak A.Ya., Nesterov V.I., Ogluzdina N.L. «Some aspects of NLS-diagnostics of focal hepatic pathology»// Collection of scientific works of Institute of Practical Psychophysics «NLS-technologies in medicine – development prospects». Vol. III. Moscow: Catalogue, 2010, pages 13-19.